I spent a very nice year in Denmark once upon a time. (Yes, I can still remember how to say about two things in Danish.) The country has many charming aspects, one of which is the fine tradition of making a meal out of good things piled on top of bread. Recently, a similar movement seems to be gaining steam here in the U.S. as well, except that we toast our bread first. I think of the evolution this way: bruschetta (1980’s), crostini (1990’s), toasts (aughts), tartines (isn’t that what we call them now?). Or maybe there’s some other difference, I don’t know. Anyway, here’s a nice way to get away with eating melty cheese on toast for dinner. 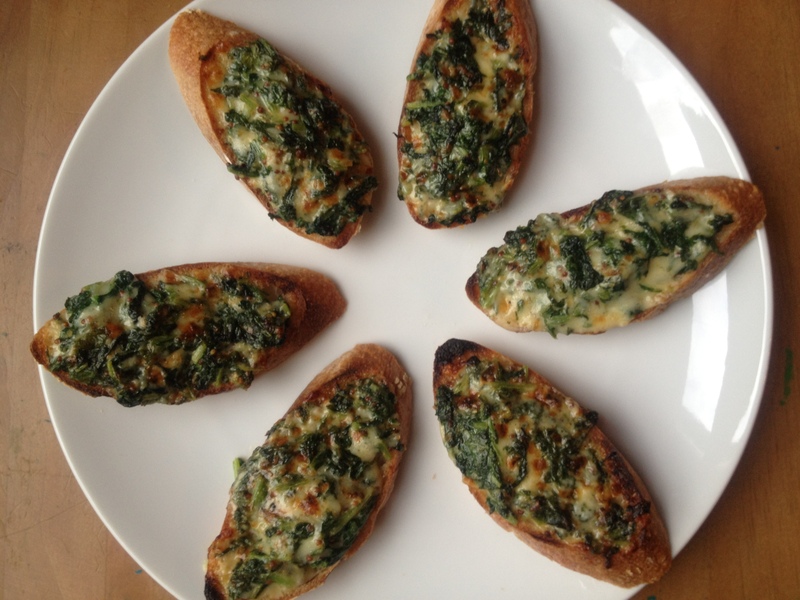 My friend Daisy at Coolcookstyle made it up by substituting radish greens for nettles in a Nigel Slater rarebit recipe, and I say it was a wise decision. You can swap the greens, swap the cheese, or vary the mustard, of course: the only two essential ingredients are bread and something delicious to put on top of it. Green Tartine: Saute the leaves from one bunch of radishes with a pinch of salt. Set aside to drain, then chop finely. Mix chopped greens with 2 Tb. crème fraiche, ½ c. grated aged cheddar, a spoonful of grainy mustard and a few grinds of fresh pepper. Heap onto bread (I used baguette slices) and broil, watching closely, until lightly browned. We had these for dinner with a garden salad. This entry was posted in Breads, Food, My Favorite Recipes, Recipes, Snacks and Apps and tagged bread, cooking, dinner, DIY, food, happy hour, lifestyle, recipes, vegetarian on June 1, 2012 by emmycooks. What fantastic little appetisers! They look yummy. I didn’t know that either! These look delicious. I’m going to have to post my radish top soup recipe soon. To be followed later in the summer by my favorite carrot top soup. OK, I will be right over. Please do come over! These are just the thing to share with a friend (with a glass of wine, of course). The original recipe calls for nettles, which I would definitely try if you’re brave enough! Those look gooey, cheesy and crunchy…some of my favorite combos!! I love your evolution of things piled on bread. That sounds about right. 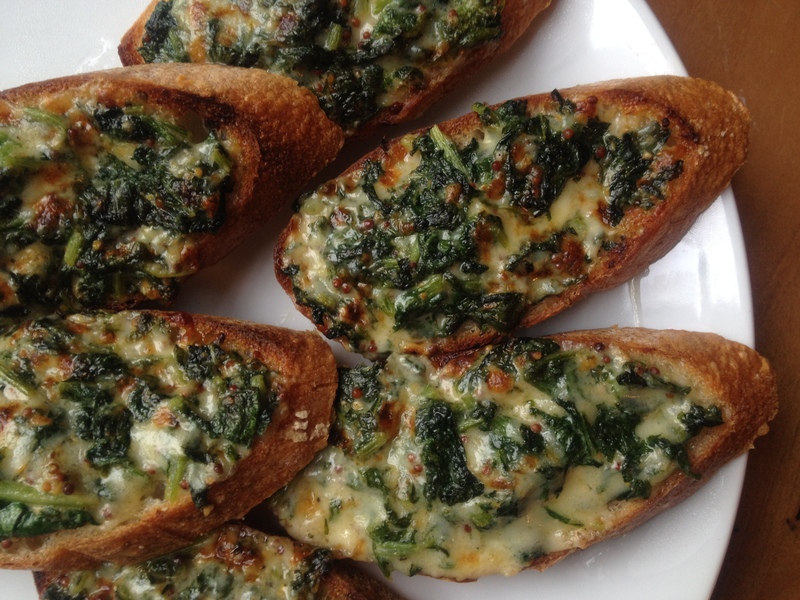 You can’t beat melty, cheesy things piled on bread though. That is so cool that you spent a year in Denmark. I bet it was an amazing experience filled with Vikings and smorrebrod! Did you have a favorite? And thanks for the shout-out! Looks like it turned out great, Emmy! Oh, those sound very yummy. Butter and chocolate on white bread. Sounds trashy and gourmet all at the same time! I totally support the good things on bread movement. A meal of “snacks” is my favorite kind. These looks really yummy! Hey, I had your avocado-and-salt-tartine for breakfast this morning! That is one of my staples when there is a ripe avocado in the house. And thank you for the introduction to 17bites! Just the name sounds elegant! Oh my gosh, I’m making this tonight. I just bought some radishes and have been trying to decide how I want to use the tops (they’re not my favorite greens, so I have to “dress them up” a little). This looks perfect. I’m also a big fan of the danish smørrebrød (that’s my one and only danish word!) technique. Who needs 2 slices of bread when you can just pile all the good stuff on one? These are genius! I’ve never thought about eating the radish greens before. There’s less and less going into the composter! YUM! Thanks for sharing. This is my kind of dinner (a.k.a, pre-dessert)!